A startup called SolidEnergy says that it has developed a new design for a safe, rechargeable lithium metal battery, potentially revolutionizing energy storage for small devices like smartphones and wearables. Breakthroughs in materials science mean that former MIT post-doctoral student Qichao Hu’s company can produce batteries with double the energy density of current-generation lithium ion batteries. This means that they can either be twice as powerful as a lithium ion battery of equivalent size, or pack the same capability into a unit half as large, according to MIT News. Lithium metal batteries have long been a subject of particular interest to researchers, given their high energy density. 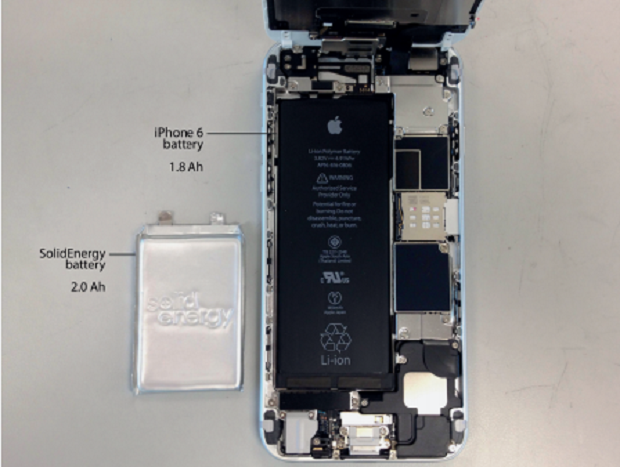 Until now, though, efforts to create a rechargeable version have been unsuccessful – the anode material tends to break down over time, quickly rendering them unusable. Hu’s design, however, not only solves the problem of rechargeability, it does away with a bulky solid anode, replacing it with a sophisticated hybrid that uses both a thin lithium metal foil and a non-flammable liquid electrolyte, MIT News reports. But better smartphone batteries are far from the only thing on SolidEnergy’s radar. The company’s latest venture funding round completed in January, adding $12 million in series B money to the company’s existing $8.5 million stake. The lead investor in that round was General Motors Ventures, and SolidEnergy has been up-front about its desire to use its batteries in electric cars. The company’s roadmap suggests that SolidEnergy’s batteries could be used in smartphones as early as next year, with the automotive sector next on the list.